I was sitting in the family room, peacefully minding my own business, watching NCIS-New Orleans when there was suddenly a blackout. It was brief and everything came back on within a minute. The winds and rain continued outside, the TV sputtered a bit and then the show was back, with minimal interruption. I went into the kitchen and was standing at the sink when there was another brief blackout. There wasn't a hint of light anywhere, which was kind of disconcerting, but again, it only lasted a minute or less and then was back. After that no more blackouts. There are several ways to check the time in this house, most of them digital. There are clocks on the microwave, the stove, the TV, the computer all the gadgets, so those that relied on power all reset themselves after the power went off. The microwave continued to keep accurate time, but warned me I needed to approve the time it was now showing. But the time piece I use the most often at home (since I do not wear a wrist watch) is this clock. This was given to my parents as a wedding gift in 1940. It sat on the table at the end of the couch in the living room for all the years I was growing up. I'm not sure when it came to us, but probably when my father died, in 1987, thirty years ago. Since that time it has sat on a bookcase that I can see from my recliner. My eyesight is so bad I can't read it all that well, but can kinda sorta check the time from the position of the hands, if not the numbers on the clock. When there is a blackout, the clock starts again when power is restored, but that little round thing below the 12 turns red, to let you know there has been an interruption of power and that you should double check the time. When you reset the time, the red dot disappears. Resetting it was always a pain after the nob on the screw fell off, but a minor pain. But somehow this blackout seems to have fried the clock. First thing I noticed was that it was NOT running and then that there was no red dot. I never realized how much I relied on that clock until it didn't work. I am forever looking over at the clock, but now it is always 10:15. A couple of years ago, Walt's sister and her husband did an extensive (and gorgeous) remodel of their house. For years, there was a clock that hung on the wall next to the television set in the living room. Every single one of us who have visited since the remodel has complained tht there is no clock there any more. Like my analog clock here, I look at the blank spot on the wall several times a day, even years after the remodel. I am a creature of habit. We don't realize how dependent we are on certain things until they are no longer there. 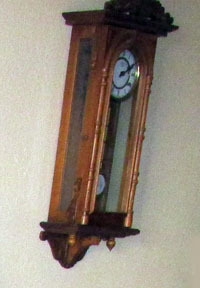 This clock belongs to my mother and has been a thorn in my side for a very long time. She went through a long period where "time" was very important to her. She was forever checking her watch and trying to figure out what time it was and then checking it against the chiming clock on the wall. Only because the clock didn't get wound regularly, it was never right and it bothered her if it was a few minutes off. I cannot count the number of times I have reset the clock, wound it again and started it going. The chimes are never right and that bothers her too. From time to time, we will cycle through the hours until the chimes match the actual time and then by the next time we go to Atria, the chimes are off again. I called a friend of mine who used to own a clock shop (and who, I was delighted to learn, still repairs clocks out of his house). He came to Atria and got the clock started again after we thought it was dead, but it's dead again now. Rewinding it sometimes starts it, sometimes not. Fortunately time doesn't seem to be as vital to her as it has been for so long. The good thing about getting my mother's clock fixed, though, is learning that Darrell still repairs clocks. As soon as I have some free time, I will call him and see if he can fix our now dead clock. I hope he can. 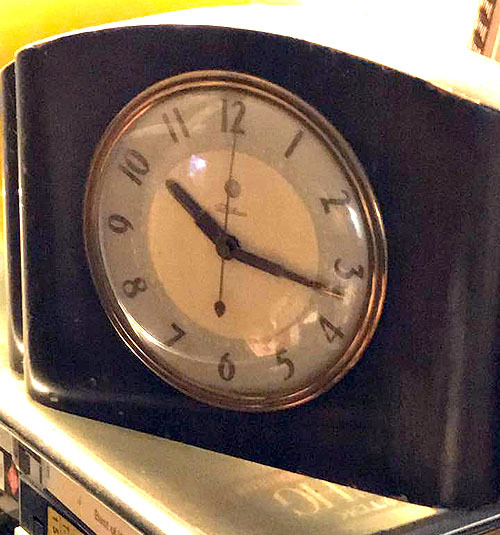 It's not a particularly fancy clock and, in truth, there's not that much sentimental value to it, but I just miss being able to look over and find out what time it is. Again, this is one of those first world problems that make me feel guilty when I realize that some of my sponsored kids don't even have electricity. the biggest fund raiser of the year.